Sometimes silly things stick with you. Sometimes you study so hard you still remember the quadratic formula 7 years after needing it(negative ‘b’ plus or minus the square root of ‘b’ squared…) Sometimes you don’t try at all, but you remember every moment of a first date. Sometimes you remember truly silly things like a Jim Carrey movie you once watched that changed your life. If the theory is good enough for Tina, it’s good enough for me. I’m not saying you should never consider the consequences of your actions. When someone asks you to meet them at 3am, alone, in a dark alley, with a bag full of cash… maybe don’t say yes. But too often do I meet people who are so fixated on the negative side of the “what if” played in their head, that they never actually experience life. 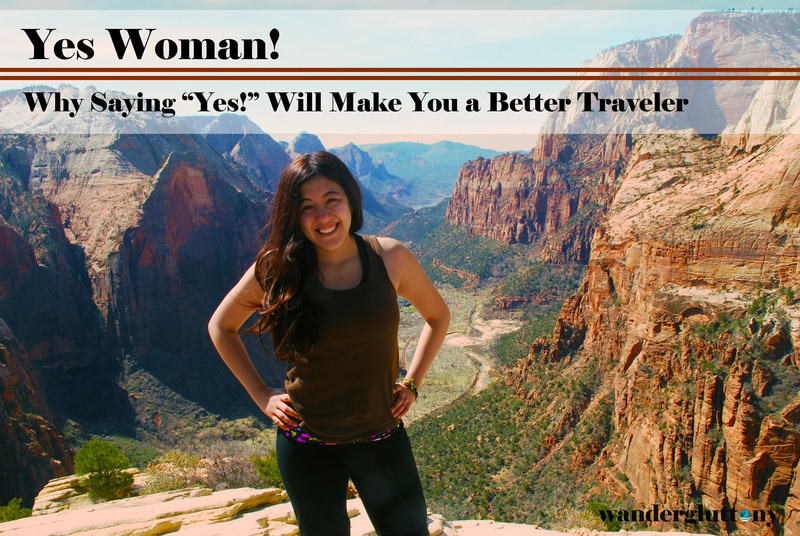 Traveling is the perfect time to test out The Yes Theory. I’m not telling you that saying “Yes!” will guarantee an easy traveling experience, only that it will enrich your experience. Honestly, saying yes may often put you in a more difficult predicament. Take for instance the time I agreed to hike up Angel’s Landing in Zion National Park, UT. Terrified of heights, I definitely did not enjoy scrambling along the cliffside desperately gripping the chains mounted into the rock wall while praying my already shaking legs did not betray me. Finally, after much goading from my best friend, Sara, I made it to the summit of the trail and was rewarded with a spectacular view and a deep sense of accomplishment. To this day I carry this memory with me and my fear of heights, although not eradicated, has definitely dwindled. I could get used to the yacht life. With my father born and raised in Hong Kong, I’ve been fortunate to visit the busy city many times. As my family often serves as the tour guides, I tend to get a similar experience each visit. This year I said yes to an invitation by my MarMar (Cantonese for grandmother) to go to an office’s grand opening. While we were there we met an old colleague of my MarMar’s. He asked us to join him on his boat the next day during the Dragon Boat Festival. Originally I had planned to go to the more touristy side of Hong Kong to see the Dragon Boat races, but when presented with the offer I immediately said yes not quite knowing what I had gotten myself into. The gentleman was conservative in calling his yacht a boat. Not only did I get to sail in luxury that day, but he also took myself and the rest of his guests to a remote part of Hong Kong where cars couldn’t reach. We sat down for a seafood spread for lunch including a beautiful whole steamed fish, lobster in gravy with egg noodles, and garlicky fried mantis shrimp all freshly caught from just off the coast. To work off the meal, we enjoyed the rest of the afternoon swimming in the ocean and taking turns with the jet ski. A simple offer for an afternoon turned out to be one of my most lavish experiences and I got to see a completely different quiet side of Hong Kong. My Hobbies Include: Drinking sangria, long walks with my dog, and promoting fish cannibalism. This summer I had the great opportunity to explore Singapore with my little sister. One of our days was spent in awe of their zoo where you can literally walk among the lemurs and orangutans and birds and bats. As my sister and I turned a corner, we saw a small gathering around a large pond. Curious, we walked to the edge of the pond and as we did the zookeeper got our attention. “Do you want to feed it?” He asked us. Although I had no clue was “It” was, I agreed and he handed me a large stick with a fish speared on the end. He told me to dangle the fish just above the water and wait. And so I waited. And waited. Until I saw a glimmer of movement under the water. Well, you can see the rest for yourself here. I’m not as brave as you; no way I could yes to everything! Well maybe not everything! But start small and say yes to a few things and see what happens! This is something I am really bad at doing, I always tend to take the safe side of things! It’s never too late to change your life! Just remember small steps! So true! 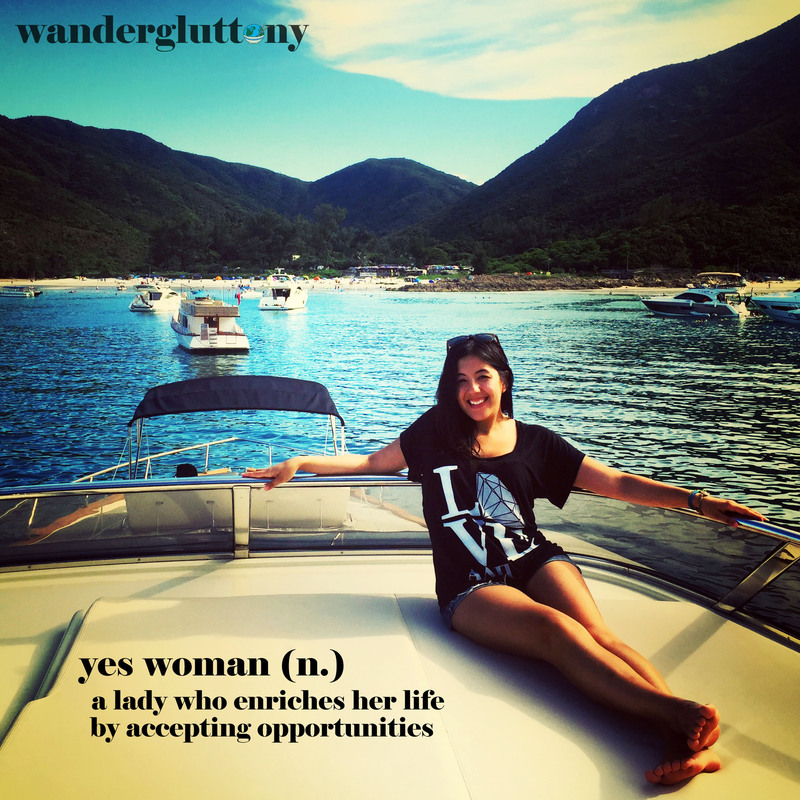 “Yes” can really open you up to new experiences, broaden your world, and enrich your travel. This takes me back to my time studying abroad in Italy in college. I learned so much that year by letting myself be open to new experiences. What a great experience that must’ve been. Traveling really is one of the greatest learning tools especially with an open mind and open heart! I’ve always tended to say yes. It’s not always the best choice, but it has certainly introduced me to situations and opportunities I would never have had otherwise! Completely support the whole saying yes theory! Definitely think this is the way to be and this will open your life to so many more experiences! So impressive you did the Angel’s Landing hike – my bf and I roadtripped across America and started that hike but didn’t make it to the very top – we were there in late Feb and the highest part with the chains was icy too so we decided not to risk it! Good for you for making it !! Agreed! And the hike is spectacular, but I’d definitely recommend only going when the weather is on par. Haha. A roadtrip across the states is very high on my to-do list. What fun that must’ve been! Great post and truly inspiring. The best experiences you will ever have start with the unknown. Agreed! Thank you so much for reading. LOVE This post! This hopefully will add soooo much value to people!!! I agree with you 100%. I believe most of the time we say no is to stay in our comfort zone. And as they say “life begins at the end of your comfort zone”. Great post girl!!!! Keep saying yes! Thank you so much! Life really does begin when you push your limits. And the power of positivity is limitless! Yes is the most powerful word in the human language in my opinion….